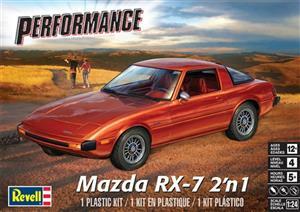 If you are looking for a well detailed 1st generation Rx-7 model kit, this is the one to get. The kit was originally released in 1979 and was rereleased in 1996 in Monogram's Selected Subjects Program. The Monogram kit offers a very well detailed cabin interior with a lefthand drive dashboard (one of only three LHD 1st gen. Rx-7 kits, the others being the Fujimi kit and the AMT snap kit). The engine bay is also fully detailed and includes a beautiful little replica of the 12A rotary engine, the only 1/24 scale kit to do so. Chassis and suspension details are also second to none. There is just one funny little error which can be easily corrected: the lock for the fuel filler lid should be at the rear of the lid instead of at the front. All parts are molded in red, wheel faces and various small parts are brightly plated and tires are made out of black vinyl. Decals offer not only license plates and decorative striping but also some accurate details such as the factory decal on the air cleaner cannister. Another Selected Subjects Program release, this time the Monogram Rx-7 kit comes in a Revell box. 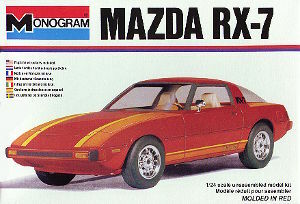 The "2 'n 1" on the box refers to the fact that all parts for the former Monogram Rx-7 CAFE racer kit are also included. The added racer parts include a Mazdaspeed aerokit (fender flares, airdam and rear spoiler), rollbar, racing seats, 'Speed Star Mk.III' wheels, wider bushes to increase track width and a racing intake plenum with air filter under the hood. Since any of these parts can simply be added to the street car, this kit allows for a range of custom versions to be created. All parts are molded in white, wheel faces and various small parts are brightly plated and tires are made out of black vinyl. The new kit decals offer not only a choice of license plates but also include those hard-to-replicate cloth patterns for the seats and accurate details such as all exterior badges and the factory decals on the air cleaner cannister for the street version. For the racer the decals offer red stripes, race numbers and sponsor decals for a white #7 car which I have yet to identify. Note that the 'Rotary engine' badge (decal nr.5) was only applied to US-specs versions. 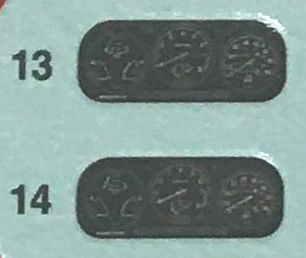 Also note that there is an error on the decal sheet: the decals for the instrument cluster (decals nrs. 13 and 14) both are black/white renditions of a 1982 (P815) cluster, which differs quite a bit from a 1979/1980 cluster. The raised instrument details on the dashboard are correct. Finally, I found some minor issues with the paint instructions, I've copied those sections with changes marked in yellow to this picture. The interior should actually be two-tone, this picture, which I found on BringaTrailer.com, shows the interior colors correctly. In addition, the plated wheels would look more realistic with a thin coat of clear satin varnish.